PHOENIX — The Arizona Diamondbacks were not expecting perfection from closer Brad Boxberger, even though members of their front office had seen exactly that several years before. 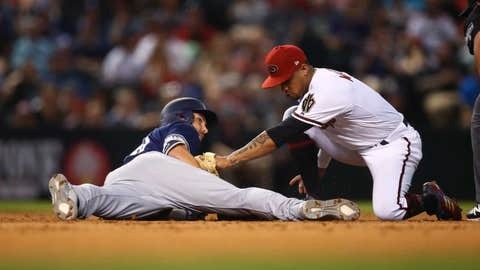 Boxberger, back in the closer’s role, converted his 21st save opportunity in Arizona’s 3-1 victory over San Diego in the second game of a four-game series Friday. He is fifth in the league in saves, and his 84 percent conversion rate ranks near the top among his peers. He came to Arizona after an eye-popping eyeball test. Boxberger is having the sort of success that general manager Mike Hazen and manager Torey Lovullo might have envisioned when they acquired him in a deal with Tampa Bay over the winter. It is the sort of work they saw first-hand while in Boston during Boxberger’s 41-save season with the Rays in 2015. Boxberger faced the Red Sox 11 times that season and was just about flawless. He did not allow a run while going 2-0 with six saves. He gave up five hits, all singles, and three walks while striking out 17 in 10 1/3 innings. Opposing hitters’ slash line: .143/.143/.211. The D-backs felt they acquired him at just the right time this offseason, after he spent the previous two seasons working through adductor, oblique and flexor muscle injuries. Like Fernando Rodney last season, Boxberger has a fastball/changeup repertoire, a combination that has enabled him to log 41 strikeouts in 31 1/3 innings. Unlike Rodney, there is less drama. Arizona left-hander Robbie Ray is scheduled to oppose San Diego right-hander Tyson Ross in the third game of the series Saturday night. “There is nothing like those last three outs in the game,” Boxberger said “There is a lot of stuff that can happen. It is just a matter of being able to control that situation. Whatever happens, to be able to control it and shut the game down. San Diego won the first game of the series with Wil Myers getting two hits and driving in two runs, but Myers was given a start off Friday after playing 13 consecutive games following his return from the disabled list June 21. He missed 47 games with a strained muscle in his side. Myers is hitting .261 with a homer and eight RBIs since his return, and he has four two-hit games in his last eight. He homered last Saturday, tripled Thursday and also has three walks in the last four games. Ray, 3-1 with a 4.89 ERA, will make his third start since returning from an oblique injury. He gave up six runs and nine hits in five innings to St. Louis in his only loss Monday. The Cardinals scored four runs in the first inning. Ray is 4-4 with a 3.98 ERA in nine career starts against the Padres. Ross (5-6, 3.78 ERA) took a no-hitter into the eighth inning of his start April 20 at Chase Field, a game the Padres won but in which he did not receive a decision. He is 4-3 with a 2.52 ERA in 14 career appearances, including 13 starts, against Arizona.